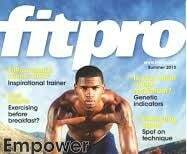 Fitpro is the world’s largest association of fitness professionals and online resource for groups, instructors, personal trainers and everyone fanatical about fitness. Here is a summary of their review of the LumbaCurve back pain relief product which appeared in the September 2014 magazine. “At first glance, the LumbaCurve seems fairly innocuous in comparison to it’s sales pitch as a “dynamic healthcare system” and “The most effective lower back pain therapy yet devised” It is a smallish, curvaceous piece of plastic that you slide under your back. The instructions pre warn you of potential discomfort whether doing it right or not, so there is no way of really knowing if you are actually doing it right. I chose to experiment with positioning until I found the least uncomfortable spot and made sure I was careful to go slow and easy with every step. I gradually went through the simple and gentle exercises and stretch routines. At first it didn’t feel like it had made much difference at all. Steroid injections for spinal stenosis?